I was asked by Silhouette to make a messenger bag style purse for some new packaging of theirs. It is a completely original design with a rhinestone shape added via the Silhouette SD. 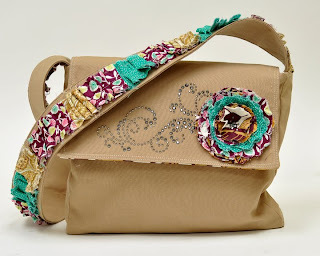 The strap is my favorite part, the ruffle is slightly frayed on the edges with an adorable zigzag stitch.